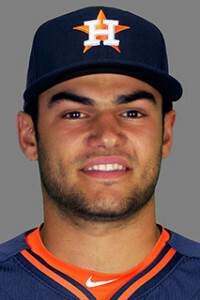 Houston Astros Starting Pitcher Lance McCullers Jr. I like surprises. Not for myself but for other people. I don’t ever want to have a surprise party thrown on my behalf, but I do like to be surprised. As a movie fan, I like it when an expected twist takes the plot in a surprising direction. As a sports fan, I like it when an underdog overachieves. I like worst to first stories and I find it easy to get caught up in cheering on the success of the unexpectedly successful. And so for me, it has been a treat to follow the Houston Astros 2015 season. This is a team that just 2 short seasons ago lost 111 games. Last year they finished 5th in their division with a 70-92 record. This year, they have already beaten last year’s win total – and there is still more than a month left in the season. 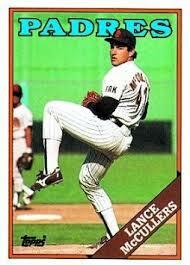 This is the Lance McCullers that I knew – from collecting cards in the 80s. 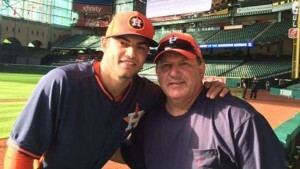 McCullers Jr & Sr for Jr’s debut. Both made their big league debut’s at age 21. One of the surprises for me from the Astros season was hearing that Lance McCullers had been called up to make a start. I used to collect baseball cards as a young boy and this name was familiar to me. I thought – Wow! now that is a comeback. I had cards of McCullers from the late 80’s. OK, so I didn’t really think it was McCullers Sr making a comeback, but I hadn’t heard that a second generation of Lance McCullers was pushing toward the pros either. Seeing the name drew my interest and so I looked into this story. 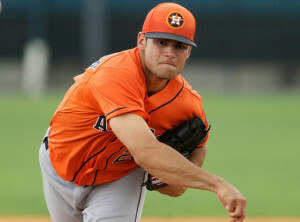 Drafted in the first round of the 2012 draft, McCullers spent less than 3 seasons in the minors. 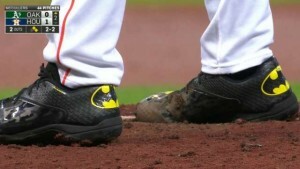 He was called up from AA on May 14th, making his debut just a few days later, wearing some awesome batman cleats. He has pitched in 15 games so far, he is 5-4 with an ERA just over 3, while averaging more than 1 strikeout per inning pitched. As you can see in this video prepared for Astros faith day, McCullers’ faith is very important to him and his mindset for playing baseball. In the video, he talks about going to a Jesuit high school, where chapel service was like a class that he had to attend. He also talks about how his faith in God helps him handle anything that life brings his way. 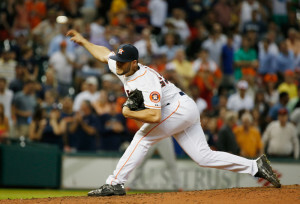 McCullers has pitched well for the resurgent Astros, looking to make the playoffs for the first time in a decade. 1- Don’t Ride the Roller Coaster – I’ve never heard it said this way before but I like it. McCullers talks about how as a baseball player you can’t allow yourself to get to “high” when things are going well or too “low” when you are struggling. There is an important spiritual lesson in this, too. God is ultimately in control and the decision to follow Him or not lies with each one of us individually. But we need to depend on God no matter what, at all times. When things are going great, we need to depend on Him. When things are hard, we need to depend on Him. He is the only constant. Let’s keep our eyes and our focus on Him. He loves us. He values us. 2- What Defines You – McCullers gives a great reminder for us about how much God values us. We can be hard on ourselves and see our greatest failures – allowing them to eat away at us. The world tends to place our value on how successful we are in their eyes – by their standards, so if we buy into their value scores, we are always trying to live up and measure up – and that can be exhausting. But God created us, he loves us enough that He went to great lengths so we could be with Him. In fact, he values us enough that he sent his only son to face death and separation from God so that we wouldn’t have to. Because of how He values us, we can be confident in Him and His love that will never run out. McCullers faith in God has been important to him in his budding major league career. 3- More Than a Class, More Than a Textbook – He talks about how going to church with his girlfriend in high school proved important in his spiritual development more than attending Bible Study as a class did. The heart is an amazing thing. When it is open to hearing and learning about God, there is nothing better. He was studying the same bible in his class at high school – but the motivation there was for a grade. When his heart connected with God, he sought to attend church to honor and glorify God, not simply for a grade. I pray that we will all allow God to draw our hearts to Him and that we will seek to honor and glorify God in all that we say and do out of love and not duty.